Finley has been pulling himself up against the furniture for a few weeks now and is getting more and more confident every day! 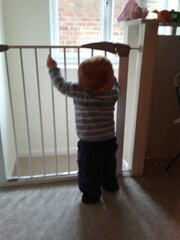 He is now cruising round our sofas and tables, so cute! His poor sister can't get away from him now, he wants to be with her all the time, it's gorgeous to watch. What are you all doing for their first birthdays? I am at work on his 1st birthday, I am gutted... but think I may celebrate the day before seeing I was in labour that day anyway so it kind of counts as his birthday! How crazy is it that a whole year has gone by already? amazing! I bet you need eyes in the back of your head now! Matilda doesn't cruise or crawl yet and is annoyed that she can't but everyone says to enjoy this time as it'll be hard work when she can move!